Mike and Skip Gardiner From Patuxent Materials Inc.
Chris Steuart from Blue Mount Materials Inc.
private landowners; fly fishermen, press, Clark Howells from the Baltimore City Water Department and House Delegate Wade Kach. Questions arose regarding lack of due process and improper notice. While the zoning hearing notice was posted in the Jeffersonian, no local residents receive that publication. Adjoining landowners complained that they did not see notices posted on the quarry property nor did they receive registered mail notices prior to the zoning hearing. Only five residents were said to have attended the actual zoning hearing before Baltimore County Zoning Comissioner William J Wiseman III. The quarry has not actively mined stone since 1997. For the past ten years it has been, a low volume business, the new owners will be changing the use of Blue Mount Quarry from a “stone yard” to a high volume, mining and rock crushing “active” quarry. There are currently no limitations on the amount of quarrying that can take place. The Gardiners have paid for traffic studies and noise studies. A special exception to zoning was granted in 1973, but the bank required reapproval of the existing permit. For another take on this issue go to Pat van den Beemt’s Article, Neighbors Blast Owners of Blue Mount Quarry”, originally published in the North County News. This entry was posted in news on March 31, 2007 by Theaux Le Gardeur. I was up last Friday with a friend and took your advice to fish below York Road. We got into a couple of beautiful fish above, in and below the first bend below York Road (our first fish of the new year, incidentally), fishing unweighted and bead-head stoneflies and zug bugs. One of these fish was pretty stout, too! Only saw 3 or 4 stoneflies in the air, but with high temps and lingering winter blues, the fishing was exactly what the doctor ordered. Looking forward to fishing more in 2007!! Once again, thanks for the expert advice!! This entry was posted in fishing report on March 31, 2007 by Theaux Le Gardeur. Please join us for a fly fishing school. On Sunday, April 1, a Gunpowder River guide will be teaching a fly fishing school that is ideal for beginners. The school covers knots, casting, gear and fly selection.Cost is $100 per person and includes the use of gear. Class size is limited to 4 and pre-registration is required. Please give us a call at 410-329-6821 or drop us a line at info@backwaterangler.com to pre-register. This entry was posted in events, news on March 26, 2007 by Theaux Le Gardeur. The Gunpowder river is flowing at 167 Cfs and is 41 F throughout the catch and release section.The river is clear, cold and is moving along at a good clip. Guide Capt. Jeff Lewatowski just finished up a guide trip with a new client from Alexandria, Virginia.They were fishing soft hackles, caddis pupa and small stonefly nymphs in riffles and flats above Falls Rd.They released a half dozen fish between 8-10″, and one 12″ fish during the trip.The water will be warming this week and leveling off as the last of the snow and ice melts. 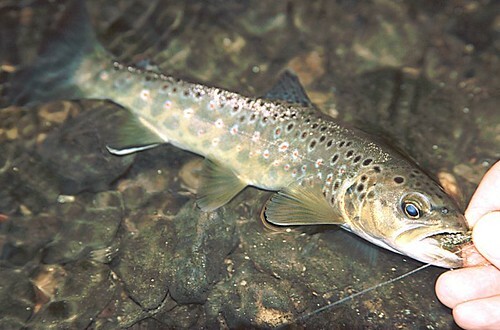 Soo…get ready to fish stoneflies! This entry was posted in fishing report on March 20, 2007 by Theaux Le Gardeur. This heartfelt letter following my earlier post, comes to us from a Gunpowder regular. Thank you Mr. Williams for voicing your opinion. the resulting additional dump truck traffic could have on the stream. minimize the impact of their operations. as a unique and beautiful place both to live and to visit. This entry was posted in news on March 16, 2007 by Theaux Le Gardeur. You guys have done a great job on the new website. The Videos are fantastic,( they make you want to fish). I haven’t fished since late summer. Will stop in soon. Due to inclement weather the MDTU Bush Cabin Run Planting Day has been postponed. Please see my earlier post for a description of this event. At this time a make-up date has not been scheduled. Due to inclement weather. We will be rescheduling the Gunpowder Favorites Tying Class with Capt. Jeff Lewatowski. Please give us a call at 410-329-6821 for rain, (sleet) date info and/or to pre-register. A public meeting will be held about a block from Backwater Angler at 7:30 PM on Tuesday night, March 13, 2007. Pat van den Beemt recently wrote an article in the North County News that described the new quarry owners’ intentions. Note:The original February meeting was rescheduled due to inclement weather. I’m asking all of you who have an interest in the Gunpowder river to attend. This entry was posted in news on March 9, 2007 by Theaux Le Gardeur. The high Tuesday was 25 F, yet Jason still managed a seven fish day with a new regular who drove down from the Pittsburgh area to fly fish the Gunpowder river for wild brown trout.The conditions were less than ideal, but they made the best of it. Today the river is gin clear and is flowing at 102 CFS, and water temps are 39 to 42 F throughout the catch and release area.This weekend, the general warming trend, with air temps forecasted in Mid to high 50’s, is a welcome sign of Spring. Water temps might still be on the cool side with the rest of the ice melting away along the Gunpowder, so focus on the shallow riffles with traditional nymphs like zug bugs, princes and Carey Specials in the #14-16 range. About midday switch to a stonefly dry in the #16-18 range. 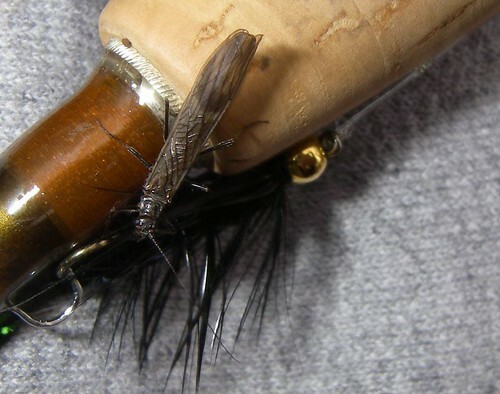 Skating stoneflies or black caddis might illicit a few strikes in some of the flat water along the edges of riffles, just make sure you use a 12ft 6x or 7x leader. This entry was posted in fishing report on March 9, 2007 by Theaux Le Gardeur.